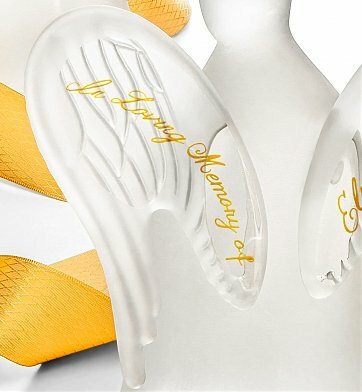 This statuesque Angel figurine's left wing is engraved with the message "In Loving Memory Of", while the right wing is engraved with the name of your choosing. The engraving is finished with a gold paint to bring out its lovely handiwork. This frosted, solid heavyweight glass Angel figurine is sure to bring warm memories and comfort. Left Wing Says: "In Loving Memory Of"
Right Wing is Engraved with Your Chosen Name or Message. The left wing is engraved with the message "In Loving Memory Of". The Angel's right wing is engraved your chosen name. One line, up to 24 characters. Enter information to be engraved during the checkout phase of the ordering process. Measures 8" Tall x 7" Wide. Weighs 4 lbs, 2 oz. if ordered by 11:00 pm EDT Sunday April 21st. Personalized Sympathy Angel is a hand delivered gift. These gifts are delivered by one of our local design centers located throughout the United States and Canada. Same day delivery is available for most gifts when ordered before the cutoff time. The cutoff time for Personalized Sympathy Angel is in the recipient's time zone. They'll remember your kindness as they display this thoughtful memorial gift of peace. Made of solid frosted glass, can be displayed on any mantle, table or dresser. Left wing says In Loving Memory Of, right wing engraved with your chosen name. Includes a gift box and complimentary card with your personal message.